Since I like jotting down notes on the go as opposed to just thinking of fantastic ideas that I later forget, I love checking out new note taking apps on the iPhone and iPad. I came across the Moleskine app a few months ago, but it languished in my "Prune" folder. I stick apps in there that I don't immediately connect with, but think that they might deserve a second, more in depth glance. Today I gave the Moleskine app a thorough look over. It's very slick, even powerful. The GUI is clean and you can tell that the developers took time to release a polished app. There are lots of features. So many features. Maybe even too many features. I can label my thoughts, color them, give them nifty icons, geo tag them, and fiddle with the font size and color. I can even import photos, crop them, then resize them for insertion on the page. The words will actually wrap around the photo, which is a powerful word processor feature not found in most note taking apps. It's all very slick. However, the app lacks the simple elegance of a Moleskine notebook. After all, what is a Moleskine notebook but a fancy collection of blank pages with a nice, hard cover, a cloth bookmark, and an inside pocket? This app comes across as too left brained and too corporate. It even prominently features a link to Moleskine's product catalog. That can be ignored, but overall, the Moleskine elements of the app are just visual embellishments. There's the slick opening graphic of a Moleskine cover, then you are presented with a list of notes. Creating a new note requires more tapping. Name it. Categorize it. Now what? Tap tap. Oh, we're finally in! There are simply too many options in the way of writing. When I want to write in my real world Moleskine journal I grab it, flip it open to the last page, and start writing. There is no fiddling. This app makes me feel like an engineer laying out plans for a building before letting me in to write. It doesn't even open each note to the last page. You have to flip through to find it. No easy cloth bookmarks to mark your way. The text is not even searchable outside the app, so for me this is a deal breaker. The notes are indeed pretty, but then you encounter the next limitation. How do you share them with people? Nevermind that the share feature is hidden away on a submenu, the sharing doesn't include the formatting. Sharing the note via email or even Facebook simply sends the text out into the world. If you had taken time to crop, resize, and layout a photo, wouldn't you want to share that effort as well? There is an entire culture of people on Flickr that do exactly this. They share their Moleskine pages down to the scribbles and side notes. I feel that the iPad apps Bamboo and Penultimate do a better job of capturing the Moleskine spirit than the Moleskine app. Each notebook is visually represented, not given as a list, and they open to the last page you worked on. They even let you export the notebook as a PDF or graphic, preserving the look and design of your creation. Unlike the Moleskine app, you cannot type text, but the point is they are more Moleskine-like than the Moleskine. 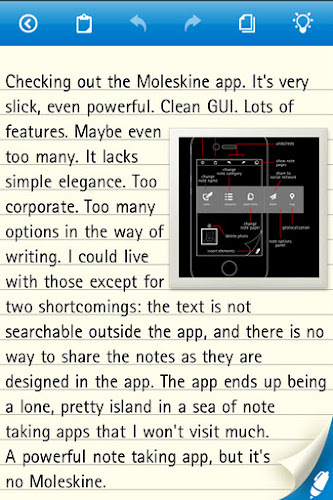 The Moleskine app ends up being a lone, pretty island in a sea of note taking apps that I won't visit much. For what it does, you may enjoy it. You may like all that fiddly detail. It's certainly one of the slickest note taking apps I have used on the iPhone. A very powerful note taking app, indeed, but it's no Moleskine. Update - 30 January 2012: The iPad version of this app is also very well put together. I may have done the app a disservice by describing it as slick. That comes across as overly glib. The presentation of the app is gorgeous, and even more so on the iPad. Moleskine is truly one of the most beautiful note taking apps out there. Unfortunately, the downsides I point out above are still a problem with the iPad version. The beauty of the app stops when you have to actually use it. Then Moleskine is too complex for such a simple task as taking notes, unless! you find such complexities desirable.